A study of paintwork, which allowed experts to date different part of the portrait, has shown Branwell only made the briefest of sketches of himself, and did not begin painting his skintone at all. The pillar is now believed to have been painted on immediately by Branwell, likely as an artistic decision, rather than seeing him covered up at a later date. By February, when the exhibition opens, curators hope to use the latest technology to show what the original image looked like in its most detail yet, and tell the full story of how it came to the public eye. A spokesman said: “Central to the display will be the presentation of new research into the only surviving painted portraits of Charlotte with her two sisters, Emily and Anne, by their brother Branwell, in the Gallery’s Collection. Lucy Wood, assistant curator of the exhibition, said latest research had shown there was no sign of “flesh paint” under the pillar, adding: “It appears that he was only ever loosely sketched and never fully painted up. The painting will go on display alongside dozens of items loaned from the Bronte Parsonage Museum, home of Charlotte and her siblings. It includes paintings and drawings by Charlotte, letters and journals, the famous ‘little books’ created by the Brontë sisters as children and the first book Charlotte ever made. Other items include a pair of cloth ankle boots worn by Charlotte, first editions of Jane Eyre, chalk drawings of the author and Elizabeth Gaskell’s biography, Life of Charlotte Brontë. Ms Wood said: “This rare chance to see the only painted portrait of Charlotte Brontë alongside illuminating personal treasures from the Brontë Parsonage Museum provides a fascinating opportunity to celebrate her life and remarkable achievements as one of the most celebrated authors of the 19th century. Similar studies had been done in the 1980s at the Parsonage, she said, building an image of the Brontë brother with his red hair between his sisters.“There had always been this myth that Branwell had painted himself in and either painted himself out in a fury or someone else had painted a column over him to hide him because he was supposedly such a bad lot," she said. "When they did all this investigation in the late 21st century, they discovered that the paint was becoming more translucent and the painting of Branwell was emerging from underneath it." It is now instead thought Branwell Brontë painted himself out after realising the "composition was too cramped", with the pillar added in too carefully to have been in a fit of pique. 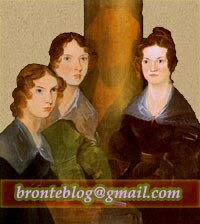 This year (2016) marks another literary anniversary, the 200th anniversary of Charlotte Brontë’s birth. Her spirit lives on, with those of her sisters and brother, on Haworth Moors – at their wildest and most atmospheric in winter and the inspiration for so much of the Brontës’ work. Heading out west from the pub, past Lower Laithe Reservoir and then back through Stanbury to the Museum Parsonage, you will pass, on the return, the Brontë Waterfall described by Charlotte as a “perfect torrent racing over the rocks, white and beautiful”. [After] putting my cakes in the oven, and making the house and kitchen cheerful with great fires, befitting Christmas Eve, I prepared to sit down and amuse myself by singing carols, all alone … I smelt the rich scent of heating spices; and admired the shining kitchen utensils, the polished clock, decked in holly, the silver mugs ranged on a tray ready to be filled with mulled ale for supper; and above all, the speckless purity of my particular care – the scoured and well-swept floor. Lo stesso si può dire per Cime tempestose (Mondadori, pp. 400, € 10): libro-sorpresa speciale per me, perché ogni volta che lavoro a un romanzo mi rifugio nelle pagine di un classico per allontanarmi, e poi riavvicinarmi, a quello che sto scrivendo, ed è stata proprio la Brontë a farmi compagnia durante tutto quest’anno, a consolarmi quando le mie pagine non mi convincevano e a spingere quelle che, voilà, improvvisamente sembravano venire da sole. Scoperta degli ultimi giorni è che, fra i suoi tanti appassionati lettori, ci fosse Balthus che nel 1933 ha dedicato a Cime tempestose un intero ciclo di disegni e un quadro di straordinaria bellezza, La toletta di Cathy. Biblioteca sin espacio (in Spanish) and Read and Dream post about Jane Eyre. Ah yes the top of the wardrobe in Banager. People see that as a boorish disregard for a Bronte relic. They do not see the Rev. Nicholls's grief,pain and yes, rage. We must view this emotional man as involved in the most personal manner possible and remember he lost Charlotte as a deeply in love newlywed and then judge him. In 1895 when Rev. Nicholls gave Shorter Anne and Emily's diary papers he recently found , he said feelingly ," Those poor girls " If Arthur's feeling and pity still ran so strongly in the 1890'a, what must they had been 40 years before?